Margo: I’ve begun asking tweeps who’ve had a go at activism in the political sphere to write about their experience for @NoFibs. Here is the first post of what I hope will be a series, by the tweep who compiled a list of Abbott gaffes which has already attracted more than 15,000 views. The tweep has given me a good reason to be anonymous. But it got me thinking. If the PM has made x mistakes between becoming PM and now, how many has Tony Abbott made? What would a laundry list for him look like? As to what constitutes a gaffe, my test was whether his words and/or behaviour attracted criticism and/or ridicule from across the political divide, over and above standard policy debate. I envisaged the laundry list as a resource for journalists who might have forgotten just how often and in what way Abbott has screwed up; and more generally as a resource for people to quote from or show to friends, relatives and colleagues so they can see for themselves that Abbott is not fit to be PM. Last month Peter Costello claimed that Abbott has changed over the last three years. Based on the list, I doubt it. I’d joined Twitter about two weeks before compiling the list. No particular reason, just decided that it was about time. But the value of Twitter quickly became obvious. By the time I was ready to publish the list at the end of March 2013, I had maybe twenty followers but a couple of those had far more. As is the way with social media, once someone with a big following retweets, or links to, an article, video or whatever, it’s off and running. Here’s a history lesson on the long road to media dominance by Rupert Murdoch, aided by both big parties, via two chapters in my book. The Liberals said yes to Murdoch under Howard, and will keep saying yes. They are partners, or rather, Abbott is Murdoch’s puppet. I also tell the story of how I lobbied minor parties to stop Murdoch’s law in the Senate in 2003, and describe Fairfax journalists’ long struggle to preserve our values of fearless independent journalism. Murdoch papers’ incendiary reaction to Conroy’s reforms – led by Murdoch’s top executive in Australia Kim Williams – means Murdoch’s empire has something to lose. Two things, actually – less chance of even further dominating Australia’s MSM, and more chance of its journalism being just a little bit accountable to the ethics of journalism. There is no chance the media reforms, weak as they are, will pass without strong action by citizens. Wilkie, Oakshott, Katter, Windsor and Thomson need to be convinced to negotiate with Labor to agree to a reform package they can sign up to and vote for quickly. They must understand that Labor has been crazy-brave to put up even this minimalist reform package, and that Labor must get this done quickly or bleed to death from Murdoch media’s relentless attacks. Over to you. Apart from anything else, your NBN needs you. In 2007 the Howard government weakened our cross media laws that were introduced by Paul Keating. And we said from that day we would be campaigning to introduce a public interest test because we didn’t believe leaving the door open for further concentrations of media in this country were healthy. I mean around the world: in the US, the top two newspaper groups cover about 14 per cent. Even in Canada, a country more akin to ourselves in terms of geography, 54 per cent coverage from the top two. In Australia it is 86 per cent coverage. We’ve already got one of the most concentrated media sectors in the world and we don’t believe it should be allowed to be shrunk any further. I’ve been entertained by the claim that this is a solution looking for a problem. Well let me read you some quotes from evidence given publicly to the Finkelstein Inquiry. It may come as a surprise to you, Barrie, they didn’t get a lot of coverage in the mainstream media. And just finally, if I could, one more, another head chair of the Australian Press Council, Professor Dennis Pearce: “Indeed we had one period where The Australian newspaper did not like an adjudication we made and they withdrew from the council for a period of months”. And Mr Finkelstein asked: “Was that a direct consequence of the particular adjudication?” And he said: “It was indeed. They said our adjudication was wrong and they were not going to publish it, and they didn’t”. Former Liberal Party federal president John Valder and Margo at a forum in the Blue Mountains, 2004. 18.02.2013: It seems I’m diving in again, so I’ve read about what happened last time. I decided to publish the past for anyone interested in the future of Australians for Honest Politics, as my beliefs about professionals partnering with citizens to do citizen journalism haven’t changed. This is an edited version of a speech I gave a few months after retiring due to burnout and ill health. Nancy Cato told me today there are no failures, only past experiences. Onward. WHEN someone from the South Australian Governor’s leadership forum suggested I speak to it on ‘the media, democracy, citizenship and globalisation’ I asked if she knew I’d just failed – spectacularly – in making a go of my independent Webdiary, which I launched last August when Fairfax gave me the choice of ditching my vision or going solo. Fairfax’s slow but relentless rejection of my work since 2001, when they made me leave Canberra and warehoused me in the backwater of the Sydney Morning Herald online, culminated, I thought then, in mid 2004. The SMH editor Robert Whitehead vetoed the literary editor’s recommendation to publish an extract of Not Happy John! and pulled a piece on the book from the Spectrum section. Fairfax Sunday papers then picked up the rights, but the Sunday Age editor reneged on the contract with my publisher and refused to pay, while the Sun Herald would not have published the extract without the last minute intervention of the features editor. The Sun Herald also cancelled my weekly column as I was about to travel around Australia launching the book. I was told when I called to advise that my piece was on its way. Naturally I saw the writing on the wall for Webdiary. The latest redundancy round had just closed fully subscribed, but they agreed to my offer to take redundancy in return for a contract to write for, edit and publish Webdiary for three years. I knew that three years would be it, and invested half my redundancy package in employing my brother Hamish to organise and launch Your Democracy, a website to experiment with citizen journalism with a view to moving Webdiary there when my contract expired. But by early last year, the new publishing system which came with the contracted Webdiary, which enabled readers to comment directly through a comments box rather than by email, had overwhelmed me. Editing and publishing the ever increasing number of comments saw me chained to my computer seven days a week, unable to research or write my own stuff. So I asked for a couple of technical tweaks to cut down processing time. From a detached viewpoint, this should have been no problem. I was on less than half my permanent employee pay doing the same job without the permanent employer add ons, a job I’d done without supervision or a writ for nearly five years. It was very popular and a unique feature of the SMH online. It remained the sole mainstream media interactive political site, one which consciously and transparently sought to fulfil the journalist’s code of ethics while allowing anyone with something to say the opportunity to do so and to criticise me and question its framework and judgment. Under Fred Hilmer, Fairfax was a short-term bottom-line-focused operation which saw journalism as an expensive and troublesome way of filling the space between the ads. Short term costs were the dominant factor in every decision apart from the size of mega executive bonuses. At first my request was dealt with by SMH online managers with no budget, so I disclosed my technical problems to readers, and lo and behold they came up with an idea I thought was breathtaking in its generosity and its advantages to Fairfax. Readers offered to edit comments on a voluntary basis and to construct a new site with upgraded technical features, also for free. Brough’s read his Ashby questions: Who will make him answer? Kathy Sundstrom Sunshine Coast Daily article asked Mal Brough some of these AFHP questions. 1. What information regarding the diaries did you receive from Ashby? 2. What dates did it cover? 3. Why did you want the information? 4. What use did you make of the information? 5. Do you consider it ethical to gain unauthorised access to someone’s else’s diary? 6. What action would you have taken as a sitting MP if your diary was stolen and given to a political rival? 7. Have you had any contact with the AFP since the judgement? 8. Did you discuss getting employment for Ashby and Doane? 9. What steps did you take to assist them? 10. Did you know Ashby or Doane before they began working for Mr Slipper? 11. 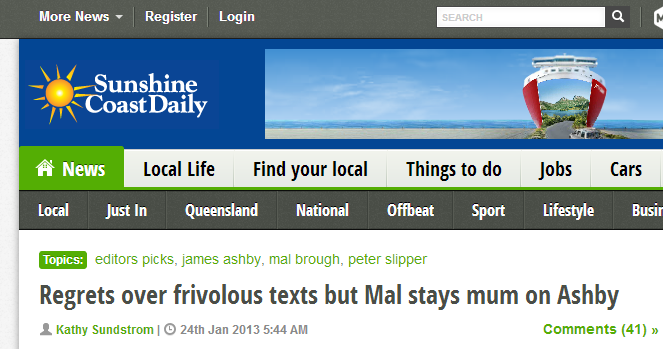 What did Ashby tell you re any possible legal action against Slipper? 12. Why didn’t you advise Ashby to follow standard and correct HR procedure if he felt he was being harassed? 13. What contact have you had with Ashby, his lawyer, agent or anyone else connected with the Court case since the judgement? Here is the full record of Margo Kingston’s Open Letter to the Sunshine Coast Daily editor Darren Burnett, his response and the subsequent Kathy Sundstrom article asking Mal Brough the AFHP questions. However the Federal Court’s Justice Rares decision stands as good law unless & until the original decision is overturned, set aside or altered on appeal. There has been no leave to appeal granted at this point. Mal Brough, when asked why he has not responded to requests for interviews, suggests no one has asked. “I am available on my mobile“. This is incorrect. Our citizen journalist Noely Neate got confirmation from at least three journalists below who tried.
.@YaThinkN Indeed – ABC has made several interview requests without success. 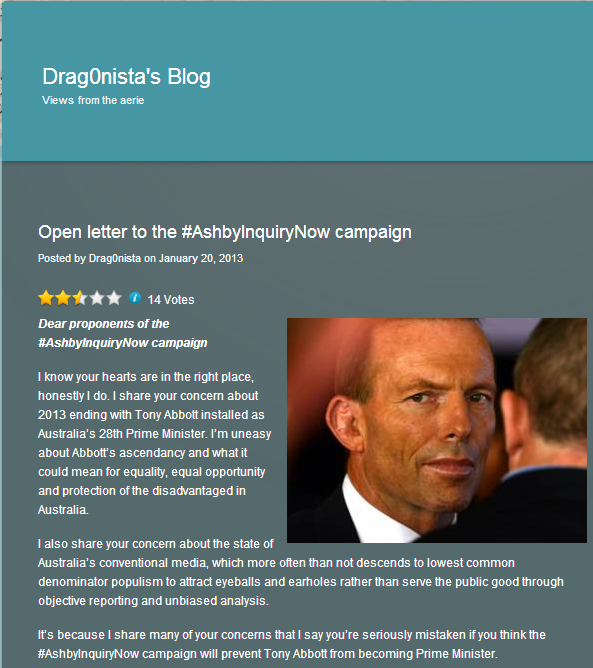 Two days ago Paula Matthewson, who tweets and blogs as @Dragonista, posted an open letter to the #AshbyInquiryNow campaign people challenging them on their strategy and aims. A stimulating discussion ensued in comments to her piece which showed that engaged citizens on the right, centre and left agreed that it was essential that the truth behind this matter be exposed and its perpetrators brought to account. But how? After the discussion, I tweeted my idea for a judicial inquiry, endorsed by Paula, to three federal politicians I follow and who follow me – Craig Emerson (ALP), Rob Oakeshott (Independent) and Richard DiNatale (Greens). I had no expectation any would reply. Perhaps due to the refusal of the mainstream media to explore the smoking gun handed to them by Justice Rares in the Ashby judgement, all expressed interest. As you’ll see, Rob has concerns at how terms of reference could be drafted, and promised to listen to people’s ideas. Abbott insisted the whole thing was done at his own initiative, and that neither John Howard nor anyone else in the government had been involved. He said most of the money had been spent trying, unsuccessfully, to get another One Nation defector, Hanson’s former private secretary Barbara Hazelton, to take legal action to stop the payment of $470,000 in public election funding, following the failure of similar action by Mr Sharples. There was more to the story. You get the drift, though. And the irony, too, given that Abbott — who set up his slush fund 14 years ago — is now leading the call for the removal of Prime Minister Julia Gillard for her role in setting up a slush fund 20 years ago. Then of course the Liberal Party and Abbott got rid of Hanson and Oldfield, but adopted much of the substance of One Nation’s distasteful policies on race issues. Then they set up a slush fund to try to ruin Hanson. Full Story at the The Global Mail. KERRY O’BRIEN: Welcome to the program. A political furore has erupted over revelations that one of the Howard Government’s most senior ministers, Tony Abbott, set up a slush fund to pay for legal challenges to Pauline Hanson and her party, One Nation. Despite repeated denials back in 1998, Mr Abbott last night acknowledged to the ‘Sydney Morning Herald’ newspaper he’d raised almost $100,000 in an attempt to fund actions against One Nation. While he and his colleagues were refusing to make any comment today, the admission is a setback for the Government. It clearly suggests Mr Abbott did not tell the truth in the affair at the time, and has provoked government fears of a backlash from voters responding angrily to Pauline Hanson’s jailing. Then, today, Mr Abbott’s stalking horse, One Nation dissident Terry Sharples, claimed that the PM was also aware of the machinations. HEATHER EWART: Pauline Hanson is wreaking political havoc once again. The severity of her sentence handed down last week raised widespread public debate and was questioned by various politicians across all parties, from the PM down. JOHN HOWARD, PM: Like many other people, I find the sentence certainly very long and very severe. HEATHER EWART: But how the political wind can shift so quickly. Now it’s turned to a desperate bid by the Liberal Party to fob off revelations today that one of John Howard’s most senior Ministers, Tony Abbott, had set up a $100,000 slush fund to ruin Pauline Hanson. And the Labor Party is having a field day. My mouth fell open when I heard Abbott’s final flourish in Thursday’s speech denouncing Gillard as unfit for office. I remembered, suddenly, vividly, Tony Abbott’s very own slush fund. Could he too have forgotten? It’s ancient history now, Abbott’s slush fund ― but less ancient than the slush fund now in the news. And there’s many unanswered questions about it, and him. In 1998, Abbott privately agreed to bankroll Terry Sharples, a disaffected One Nation member, to take legal action against Pauline Hanson. ‘…misleading the ABC is not quite the same as misleading the Parliament as a political crime’. He then created a slush fund he called Australians for Honest Politics and raised $100,000 for it from 12 people he declined to name. The fund began bankrolling more court actions against Hanson and her party. And there it rested, his lies largely unknown to the public, until court proceedings by Sharples he’d helped kick-start finally resulted in her being jailed. The overwhelming majority of Australians, like her or hate her, hated that, blamed Abbott for setting the legal wheels in motion, and wanted to know the details. 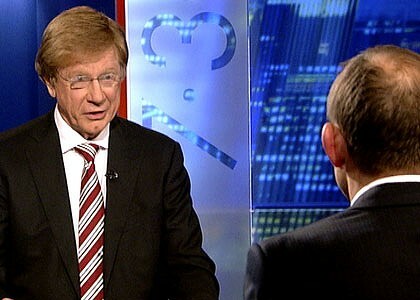 In a famous interview, Kerry O’Brien demolished Abbott’s facade of misunderstood nice and proved to a much bigger audience that he was a serial liar. The Sydney Morning Herald’s Mike Seccombe then reported that, in 1998, the Australian Electoral Commission asked Abbott to disclose his donors, as required by law. The AEC took him at his word and closed the file until forced to reopen it in 2003. Has Tony Abbott been protected by some slip-shod work at the Australian Electoral Commission? Read on. “Margo pinpoints everything that’s wrong with the Howard Government – but, being Margo, wants to talk about more. Much more. Too much more. “Eighty odd pages of brilliant polemic on matters ranging the corruption of the system supposed to protect the integrity of Australia’s electoral system downwards is obscured by 350 pages of tangents. It’s so Margo. Passionate, captivating and utterly infuriating all at once. I don’t think Margo liked my remarks, but six months and an election later, I feel that they’re even more applicable – particularly after reading The Australian today. Towards the end of Not Happy John there’s a fascinating chapter called “Australians for Honest Politicians”. It’s lengthy and impossible to summarise adequately here, but is perhaps the most comprehensive journalistic investigation of the campaign Tony Abbott conducted against Pauline Hanson under the Australians for Honest Politics banner. It’s also scary as all hell. And – surprise, surprise – it got completely buried by the hype and hyperbole surrounding much of the other material in the book. The chapter makes some serious allegations about the truthfulness of Abbott’s public statements about Australian for Honest Politics. More concerning, it also examines the legality of Abbott’s activities in his campaign against Hanson – and, remember, whatever you think of Margo, she is a lawyer by training. Margo looked in detail at the way in which the Australian Electoral Commission – the supposed guarantor of the integrity of the way in which the elections that are fundamental to our democracy are run and the integrity and propriety of their participants – dealt with Australians for Honest Politics.